Nuvothera announced today (Jan. 3) that the National Psoriasis Foundation (NPF) has awarded Prosoria its prestigious Seal of Recognition. Prosoria is an effective new treatment system for relieving symptoms of psoriasis, the world's largest autoimmune disease affecting more than eight million people in the U.S. and 125 million worldwide. Nuvothera announced today (Jan. 3) that the National Psoriasis Foundation (NPF) has awarded Prosoria its prestigious Seal of Recognition. Prosoria is a new treatment system for relieving symptoms of psoriasis, the world's largest autoimmune disease affecting more than eight million people in the U.S. and 125 million worldwide. Over-the-counter self-treatment is also a growing trend as insurance copayments and high deductibles are ever increasing, he noted. As an over-the-counter product, Prosoria will be available mid-January without a prescription on amazon.com and the company’s website http://prosoria.com. Founded in 2014 and based in Ft. Worth, TX, Nuvothera was formed with the mission to develop novel OTC products for difficult-to-treat skin diseases such as psoriasis and incorporating natural botanical ingredients using the latest in scientific knowledge and evidence-based research. The company’s primary focus is psoriasis. The management team consists of seasoned dermatology pharmaceutical executives who focus on the needs of the individual having psoriasis and partnering with the psoriasis community. “Our passion for how our products can impact people’s lives is what drives us,” said Bev Hope, Director of Marketing. “Nothing makes us happier than hearing from our Prosoria users and seeing their amazing results.” Incorporating the scientific standards of the pharmaceutical industry, Prosoria products are dermatology and clinically tested. 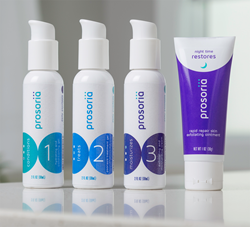 To learn more about the new Prosoria Daily Psoriasis Treatment System, visit http://prosoria.com.